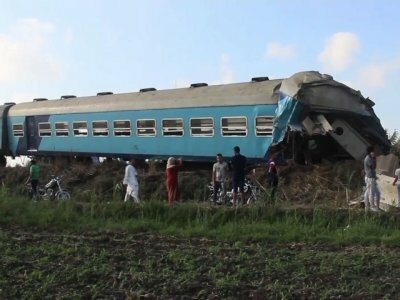 ALEXANDRIA, Egypt (AP) — Two passenger trains collided on Friday just outside Egypt’s Mediterranean port city of Alexandria, killing 43 people, according to authorities, the country’s deadliest rail accident in more than a decade. Magdy Hegazy, a top health official in Alexandria, said that along with the 43 killed, the crash also injured 122 people. The Egyptian Railways Authority said earlier that a train coming from Cairo, Egypt’s capital, crashed into the back of a train that was waiting at a small station in the district of Khorshid, just east of Alexandria. The stationary train had just arrived from Port Said, a Mediterranean city on the northern tip of the Suez Canal, when it was hit, according to the statement. The statement did not say what caused the accident, only that the authority’s experts would investigate. Associated Press footage from the scene showed mangled train coaches on the tracks and several others derailed as hundreds of onlookers and victims’ relatives gathered around on both sides of the tracks. Ambulances were standing by and riot police and soldiers were deployed to keep the onlookers away from the scene of the disaster. Residents from nearby homes rushed to the scene to look for survivors inside crushed train carriages or offer first aid to the injured. “We ran to the scene and we found people jumping from the train and lots of dead,” said Abdel-Bari Abdel-Hamid. By nightfall, cranes aided by floodlights began to remove the wreckage off the tracks to allow rail traffic to resume. Rescue teams, meanwhile, continued to look for more bodies and injured passengers inside the carriages. Egypt’s railway system has a poor safety record, mostly blamed on decades of badly maintained equipment and poor management. Friday’s crash was the latest in a series of deadly accidents that have claimed hundreds of lives over the years. Figures recently released by the state’s statistics agency show that 1,249 train accidents took place last year, the highest number since 2009 when the number reached 1,577. Friday’s accident was the deadliest rail accident since 2006, when at least 51 people were killed when two commuter trains collided near Cairo. And earlier, in 2002, a massive fire engulfed a train filled with local holiday travelers. The train sped for miles, with flames engulfing one carriage after another, killing more than 370 people. In November 2012, a speeding train crashed into a bus carrying Egyptian children to their kindergarten in the country’s south, killing more than 50 — mostly children between the ages of four and six. Two months later, at least 19 people died and more than 100 were injured in a train derailment south of Cairo.